The research report, titled “Pain Management Therapeutics Market - Global Industry Analysis, Size, Share, Growth, Trends and Forecast, 2012 - 2018”, from Transparency Market Research (TMR) offers a 360-degree view of the market. According to this report, the global pain management therapeutics market will decline at a 5.5% CAGR during the forecast period from 2012 to 2018. In 2011, the global pain management therapeutics market was worth more than US$40.9 bn and by 2018, it is expected to shrink to a value of US$29.4 bn. The global pain management therapeutics market will decline due to increasing adulteration and expanding reach of fake drugs in developing regions. Furthermore, growing prescription drug abuse will also suppress the market. In addition to this, the global pain management therapeutics market will also be challenged by the long-term pain relief offered by alternative therapies, surgical procedures, and medical devices. The diminishing power, influence, and funding of pain advocacy groups will also challenge the growth of the global pain management therapeutics market. The global pain management therapeutics market is worth billions and benefits from factors such as favorable regulatory scenarios and healthcare reforms, rising incidence of chronic pain disorders, and presence of easy and effective medications. Broadly, the global pain management therapeutics market is segmented on the basis of therapeutic class, indication, and geography. 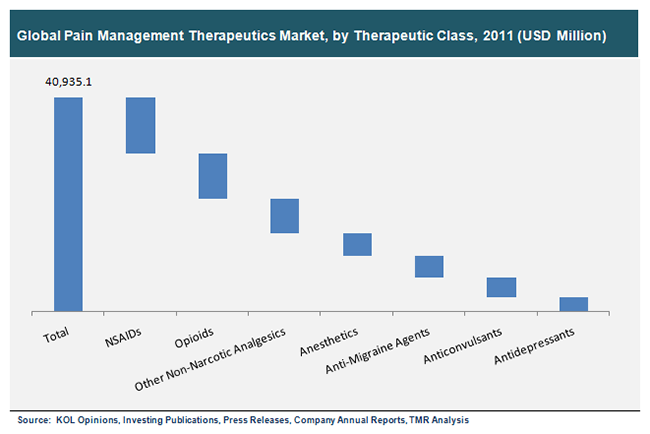 By therapeutic class, the global pain management therapeutics market is divided into opioids, NSAIDs, anesthetics, antidepressants, anticonvulsants, anti-migraine agents, and other non-narcotic analgesics. In 2011, the NSAIDs segment was the largest revenue generator in the global pain management therapeutics market due to the steady sales performance of some of the most commonly used over-the-counter painkillers: ibuprofen, diclofenac, and aspirin. According to indication, the global pain management therapeutics market is segmented into cancer pain, post-operative pain, migraine, chronic back pain, arthritic pain (rheumatoid arthritis and osteoarthritis), fibromyalgia, and neuropathic pain. By indication, neuropathic pain and cancer pain were the two largest segments of the global pain management therapeutics market in 2012. These segments are driven by the growing incidence of conditions such as cancer and diabetes. On the basis of geography, the global pain management therapeutics market is classified into Asia Pacific, Europe, North America, and Rest of the World (RoW). Although North America will witness declining revenue, it will still continue to dominate the global pain management therapeutics market in terms of revenue. In 2011, the North America pain management therapeutics market was estimated at US$21.7 bn and by 2018, it is projected to shrink to a value of US$14.2 bn. The two most lucrative regional segments of the global pain management therapeutics market are Asia Pacific and Rest of the World. Healthcare amendments and rigorous government initiatives will drive these two regional markets. On the other hand, the economic slowdown in Europe will further add to the declining revenue of the European pain management therapeutics market. Two key opportunities that players in the global pain management therapeutics market are tapping into are the rising demand for generics and the growing number of novel molecule combinations and drug delivery techniques. The key players operating in the global pain management therapeutics market are Sanofi, Purdue Pharma, Pfizer, Novartis, Merck & Co., Covidien, and Abbott Laboratories.